The big bike and trail run issue is here! It’s time to dust off those bikes and hit the trails, and we have all of the info that you need to start biking season off right. 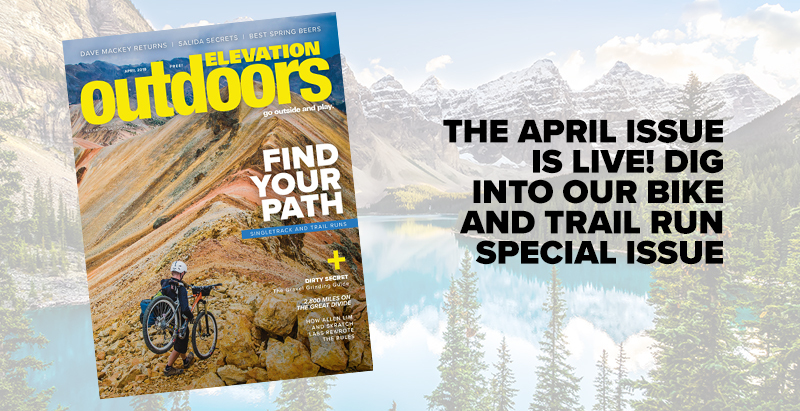 From exploring the Arkansas Valley on two wheels, to the bikes and gear that we’re stoked on right now, to epic tales of life-changing biking moments, it’s all in our latest issue. Read on or pick up a copy on stands now. The outdoor community needs to come together to act and save the species of this planet from mass extinction. Coaches and competitors share their top tips on how to train for a long-distance bike race. A new multi-discipline competition aims to give more young riders—and adults—a chance to show off their stuff. Famed for arts and food, New Mexico’s chill capital city also has one of the best trail systems in the country. If you want a mountain bike escape that delivers plenty of culture when you are out of the saddle, point it south and prepare your tastebuds for Southwestern treats. As balmy temps return to the Rocky Mountains, the time is now to search out fresh new brews to pack along on your outdoor adventures. Here, we introduce you to four craft concoctions that pair perfectly with spring weather. Learn why dirt-road riding is the next big thing in cycling—and how you can hop on the trend. Are you ready to take on the challenge to bike the best trails on the planet? How a preeminent sports scientist built a brand based on authentic values out of the ashes of cycling’s doping scandal. The Land of Enchantment casts a spell of adventure and entertainment that you don’t want to miss this summer. We put these new rides to the test on trail, dirt and pavement to come up with our list of the best bikes for 2018. Leftover Salmon and Trampled By Turtles hit the road with new albums. Elwayville: Spring is For Skiing! This may be the bike issue, but let’s save some room for a few warm thoughts about soft snow, happy Texans and cold beer.